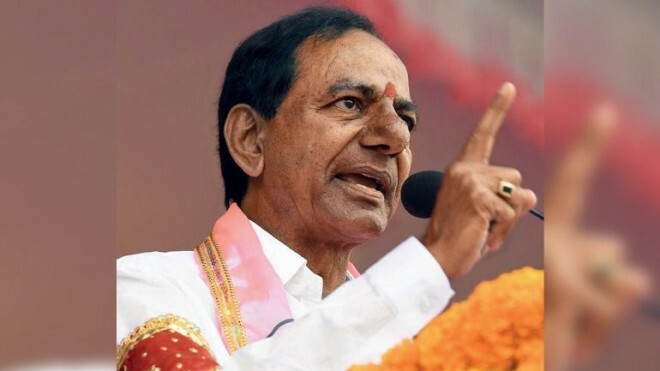 Hyderabad, Apr 09: The comments made by Telangana Rashtra Samithi president and chief minister K Chandrasekhar Rao, just 48 hours before closure of campaign for assembly elections in Andhra Pradesh, extending support to YSR Congress party president Y S Jaganmohan Reddy came as a surprise to political analysts. Though KCR announced long ago that he would work for the defeat of Telugu Desam Party president and chief minister N Chandrababu Naidu in the AP elections as a return gift and join hands with Jagan as part of his federal front efforts, he never made any attempt to campaign for YSRC nor did the TRS leaders visit Andhra Pradesh all these days during the campaign. Even when Naidu was making strong comments against KCR and Jagan alleging a strong nexus between the two, KCR remained silent. He did not even react when Naidu alleged that the TRS had sent Rs 1000 crore to Jagan towards election expenses. But on Monday, KCR came out in the open in support of Jagan and he would help the YSRC in achieving special category status to AP. He also extended his support for the completion of Polavaram project. One wonders whether KCR's statements would work in favour of YSRC in the elections or help the TDP defend its allegation to prove the TRS-YSRC nexus. YSRC leaders are of the view that KCR’s statements completely nailed Naidu's allegations. "By saying that he was not against Andhra people and that he favoured special category status to AP, the TRS president only made a friendly gesture towards Andhra and it will help YSRC in a big way. He also wished the speedy completion of Polavaram, which is a positive sign. He did not make any negative comments against Andhra people," a YSRC leader said. But, another section of media says KCR's open support to Jagan would prove counter-productive to the YSRC. "The question naturally arises as to why the TRS did not support the no-confidence motion of the TDP against the Centre on special category status and had not supported the TDP in the House. Secondly, his own party leaders opposed special category status in public," a TDP leader pointed out. On Tuesday, Naidu questioned whether KCR would write to the centre immediately on Poalvaram and withdraw his government's petition in the court. Many other TDP leaders questioned why TRS leaders such as Harish Rao and other MPs had outright rejected Special Status to AP earlier. It remains to be seen whether KCR's last minute utterances would really help Jagan in a big way or cause damage to YSRC.